I really like variegated yarn, but I don't like the "interruption" effect that comes from adding a piece of knitting in a color at a different place in the color gradient. Furthermore, I don't really like finishing sweaters, i.e. sewing pieces together etc. 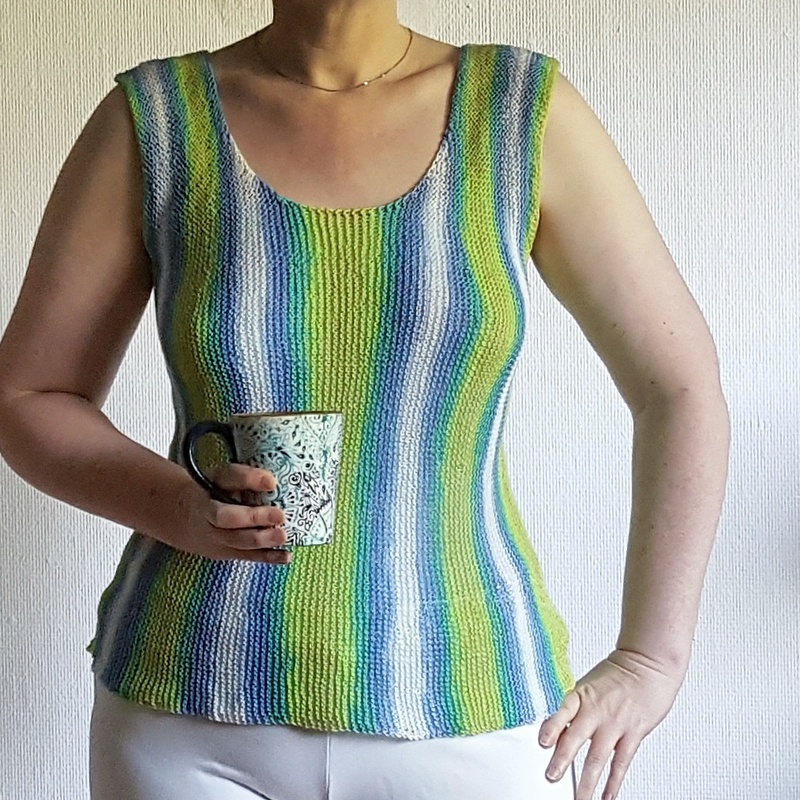 So, when I bought a few skeins of a beautiful variegated yarn, I started thinking about how to knit it into a top in one contiguous piece ... and here's what I came up with. 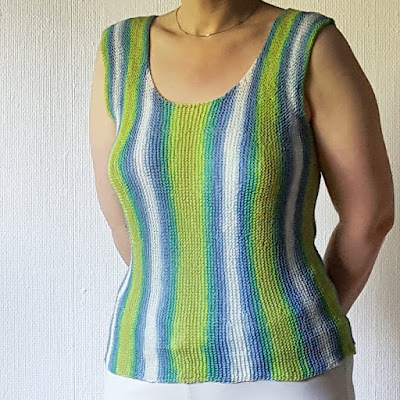 As with my Summer Garter Stitch Top and my Waterfall Tunic this is not a stitch-by-stitch pattern with stitch and row counts for various sizes but rather a tutorial on how to knit a top like this. You will have to swatch and calculate for yourself. So this top is completely configurable to your wishes and your shape. I will however give you my numbers and calculations as an example (written in purple). ... I hope, it is not too complicated. I used about 120 grams of lace weight yarn - however, this tutorial is written in a way that it can be adapted to other yarn weights as well (I used Jaipur by Katia - here's a link to the yarn's Ravelry page). Provisional CO: My favorite method for a provision CO is the crochet provisional CO - it is shown in this Youtube video by New Stitch a Day. Short rows with wrap and turn (w+t) - as shown in this YouTube video by Very Pink Knits. Knitted Cast-On: See this Youtube-video by Very Pink Knits. Cable Cast-On: See this Youtube-video by Very Pink Knits. Grafting in Garter Stitch: A technique to get an invisible (knitted) seam - this technique is shown in this YouTube Video by knittinghelp.com. 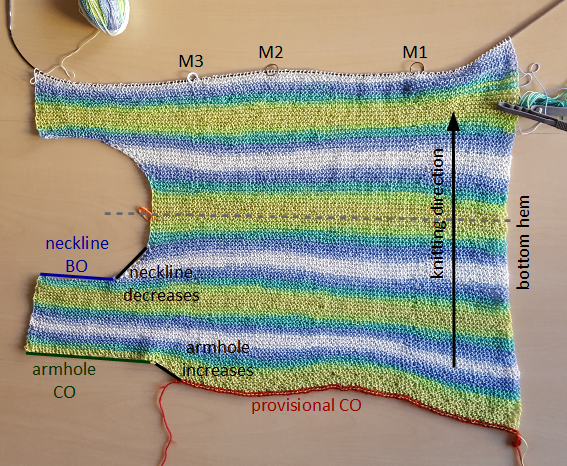 Stretchy Bind-Off: see this YouTube-video by Knitting Pipeline. There is also something, I'll call normal BO in the instructions: see this YouTube-video by Knit Purl Hunter. Take the following measurements - either on yourself or using a top that fits you well. Furthermore (not on the picture) you need to measure the height of your bust (top of your breast to just below your breasts). This number will be called N.
While you're knitting the front piece you add in short rows, a) to make sure that the bottom edge is wide enough to fit around your hip and b) to add bust "darts". These bust darts are not added at the back of the piece - instead the added width is knitted into an underarm part. However, there are also short rows to make the piece fit around your waist. The 2nd half of one piece (front or back) is the exact mirror of the 1st part. So it's really useful to take notes while you're knitting, in order to be able to knit the same rows in the opposite order. 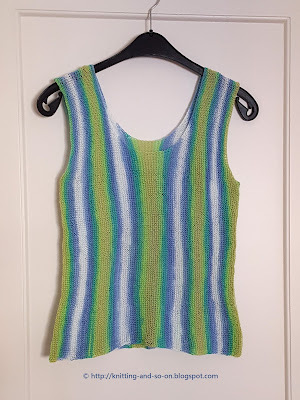 When knitting the shoulder parts of the back piece you can connect them to the shoulder of the front piece while knitting - alternatively, you can sew them up after finishing. You'll notice that I've used different COs and BOs for different parts of the piece. That's because different COs and BOs have a different "stretchy-ness". For the arm hole I wanted something rather elastic, that's why I chose a stretchy BO and a knitted CO. However, for the neckline I wanted something more stable, that's why I chose a "normal" BO and a cable CO.
Knit a swatch in garter stitch that measures at least 10cm by 10cm. For this kind of project it is really important. I'm not a "swatcher" myself (i.e. I usually avoid knitting a swatch at all cost), but in case of a fitted top you're either really lucky (and it fits) or it safes some time and effort because when you start knitting without concrete ideas about stitch and row numbers, you just end up knitting a bigger swatch. Then start calculating how many stitches and rows there are for each of the measurements you took. Here are my calculations for stitch numbers and ridges - rounded. My swatch measured 22 sts for 10 cm in width and 22 ridges (44 rows) for 10 cm in height. You need to calculate the number of short rows - for bust darts and hip, per half of one side. For the bust darts this is E-D, and F-D for the hip. To calculate how often they need to be done, divide the number of waist ridges (D) by E (for the bust darts) and F (for the hip) respectivel - taking into account the ridges you knitted before you started the shaping short rows (A). the hip shaping ridges need to be done every 5th row ((D-A)/9=(45-4)/9=4.555, rounded 5). You also need to calculate the length from just under your arm to the bottom edge for your first (provisional) CO, this is L-I, in my case 60-21=39 cm (86 sts). With provisional CO cast on L-I stitches and knit the first row with your working yarn. This first row is knitted upwards (i.e. 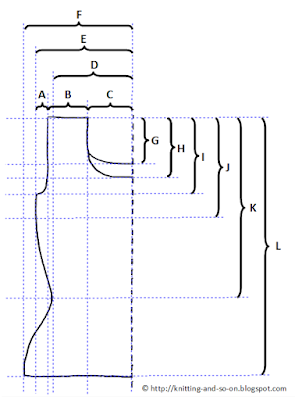 from the bottom hem of the top upwards, ↑). To achieve a rounded arm hole, you need to increase a few stitches at this end before you cast on (with a knitted CO) the stitches for the armhole. That's why I knitted one kfb at this end in every row while knitting the distance A, i.e. After these ridges, I did knitted CO of the stitches that were needed for the armhole (I minus the increases already done). In my case I knitted 9 rows (very first row after provisional CO plus four times R1 & R2), i.e. I had increased by 8 stitches. So I cast on 38 sts (46 (I) - 8 (increases) = 38). Now you need to start inserting the short rows for shaping waist and bust. In my case (with N = 33 sts) I knitted 16 sts on the way up /(counted from M2) and 17 sts on the way down (counted from M2)). When the shoulder seam measures B ridges, knit your neckline, i.e. BO three quarters of H at the top - i.e. start BO in the beginning of a top-down row. During the next rows, decrease one stitch at the top edge until you've decreased a , i.e. In my case (with H = 35 sts), I did a BO of 26 sts, and decreased on the top edge by one stitch for the next 9 rows. 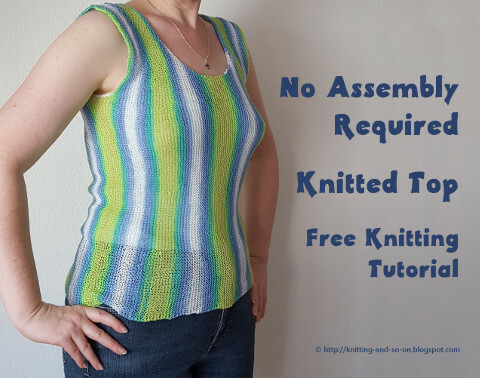 (Don't forget to insert the hip and bust short rows while knitting the neckline). Knit to the middle of the front piece - without forgetting to knit the bust and hip shaping short rows. Put a removable stitch marker into the first stitch of the next row to mark the middle of the front piece. for every increased stitch on the top edge during the first half, you decrease a stitch in the second half - and vice versa. After you've knitted nearly all of the first part, your piece should look as shown below. After finishing the 2nd half of the front you should have the same number of stitches you CO in the first provisional CO.
repeat from * until you've knitted E-D ridges. 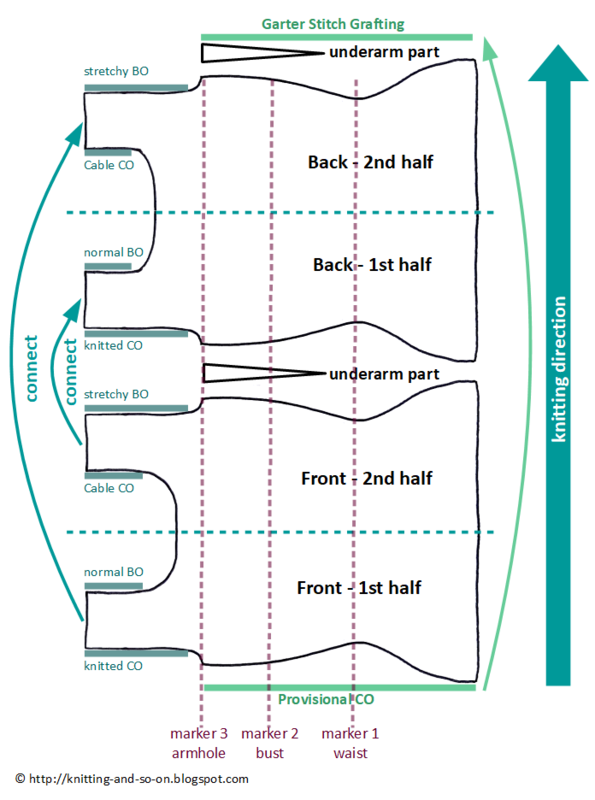 Knit the same rows as in the 1st half of the front bit, with the following differences. Do not knit the short rows for the bust darts. 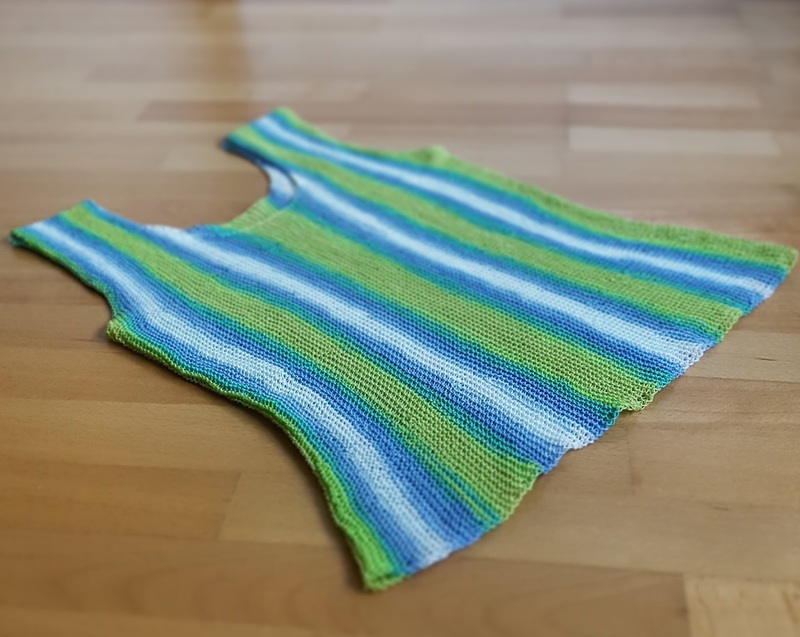 When you've knitted the armhole CO (and start to knit the shoulder seam), you can connect the first stitch of the next top-down row to the last stitch of the second shoulder seam of the front part. Connect the first stitch next top-down row to the next stitch of the shoulder seam of the front part (alternatively, you can sew up both shoulder seams after finishing). 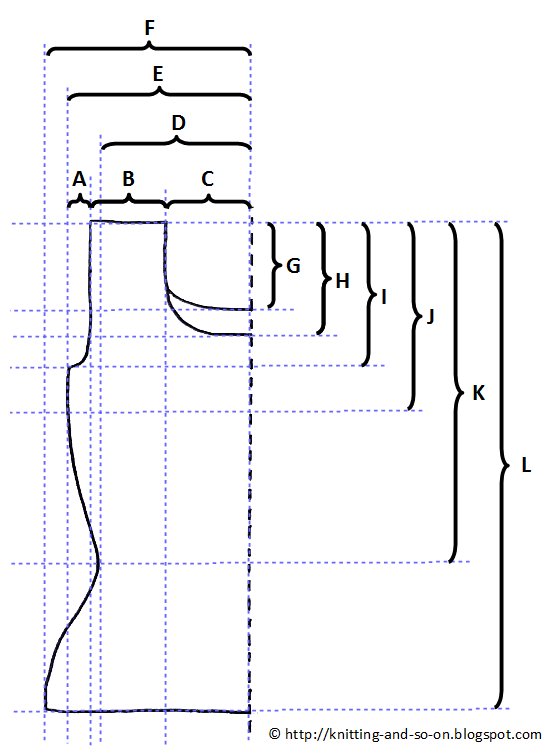 When decreasing for the neckline, use G sts (instead of H). The same goes for the increases later during the 2nd half of the back. connect the 2nd shoulder seam of the back to the first shoulder seam of the front. Knit this exactly as the 1st underarm part. Make sure that your last row is knitted upwards. Put the stitches of the provisional CO on the second needle. Cut your yarn but leave a tail that is long enough for grafting - I usually leave a tail that is 5 times the length of the seam to be grafted. Graft in garter stitch.